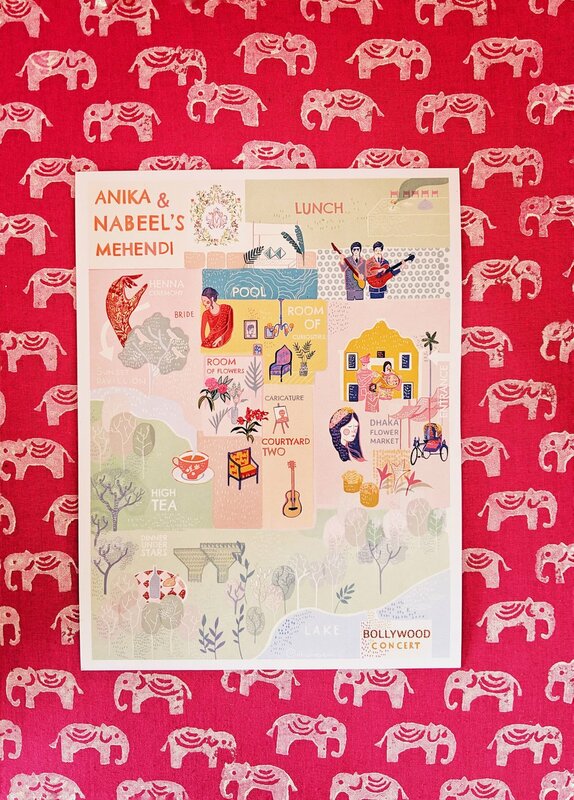 Anika and Nabeel’s wedding is by far one of the most unique weddings we have designed. Originating from Dhaka, both have traveled and lived all over the world. For their wedding they wanted to invite their friends and introduce them to the rich cultural heritage of Bengal. We worked with local artisans and craftsmen and handcrafted a beautiful wedding for them in their many homes. A mad twist on the Sunderbans, the dinner was a recreation of a forest- with neon and life-sized animals of course! 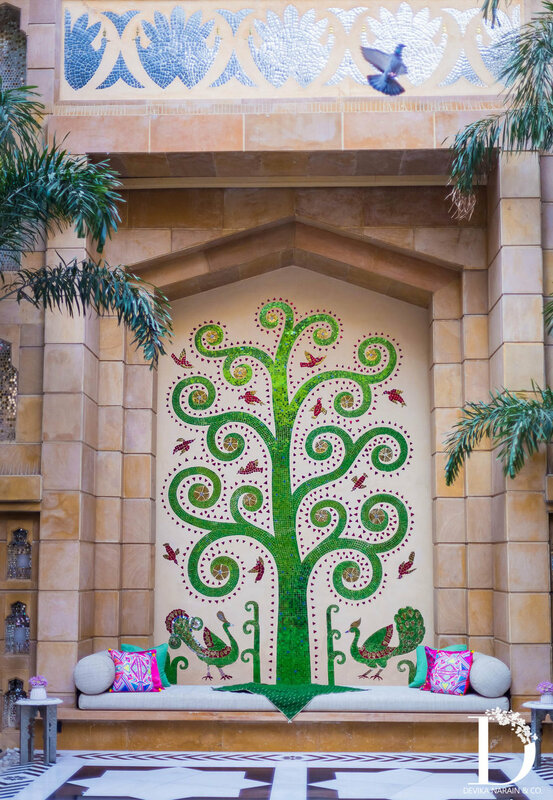 Each detail was locally made -in fact, the walls masking the property were hand painted by a local artist. I will never forget the first time I met Anika, it was past sunset and we met in a dimly lit hotel on Lodhi road in Delhi and in she walked with a giant blueprint. What unraveled was a home they were building outside of town, that we spent the next eight months transforming into a mehendi venue with her team. The function was spread over an entire day (the invitations were for noon and the last guest left post breakfast the next day!) and we wanted to create multiple moments of discovery for the guests. Each space was imagined differently, inspired by the venue, architecture, culture and personal preferences of the family. 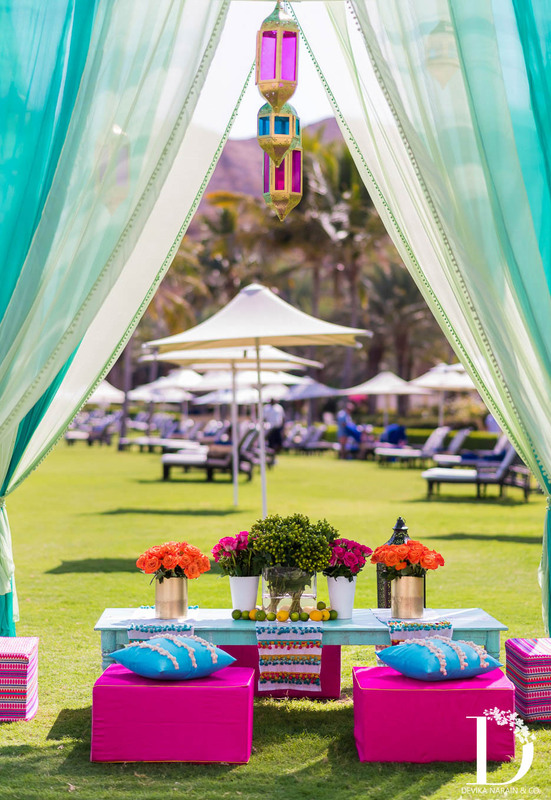 The entrance imagined as a flower market led into a Mexican inspired pool lunch and a concert stage set for dinner. 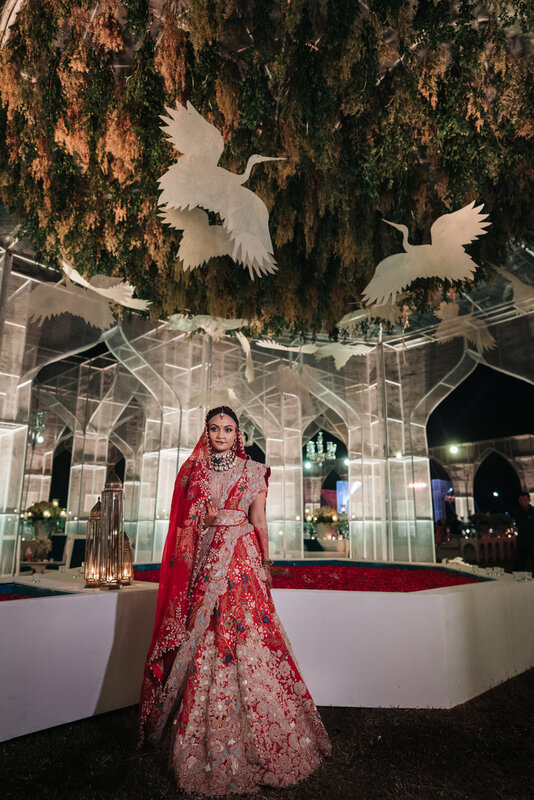 The tea garden was imagined as her favorite restaurant in India and the bridal area was an installation of over two thousand hand painted birds. Our favourite part of course were the surprise rooms- a room filled with marigolds, one using just prints, a perfumery and a curiosity corner. The wedding venue was perhaps the largest venue we have ever designed. A magical Persian city inspired by Tresoldi’s grand structures was created for the reception. A dreamlike city of arches and fountains with floating birds stood over the three thousand guests as local artisans performed in a stage especially built for them. 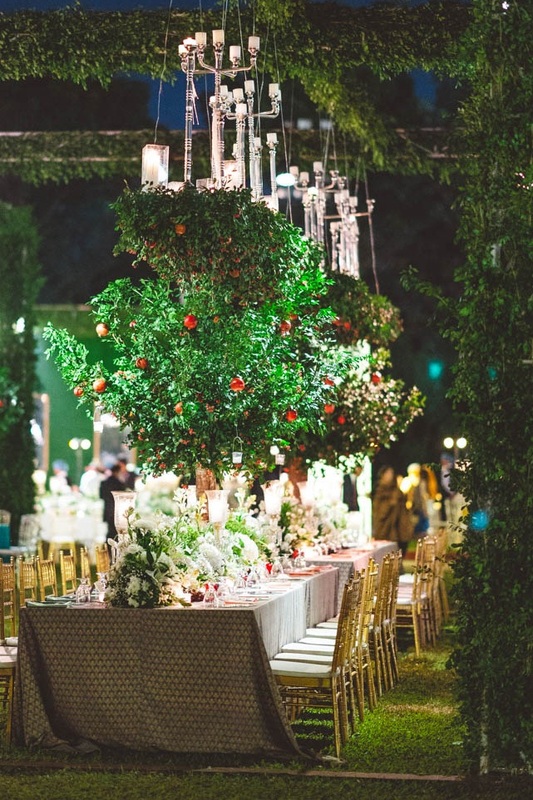 Dinner was laid out in a setting inspired by Persian gardens with large pomegranate trees and details fit for an emperor. Planning: Motwane entertainment and weddings. Photo: Weddings by Ehab, Reminiscence Photography, Celebrate Once. Special thanks to the entire team at Square, Dhaka. We adored tailoring this beautifully local destination wedding of love and celebration around Kanika and Rakshit – a perfect example of true happiness and joy! Their wedding was a coming together of two culturally different families that at the very core were very much the same. 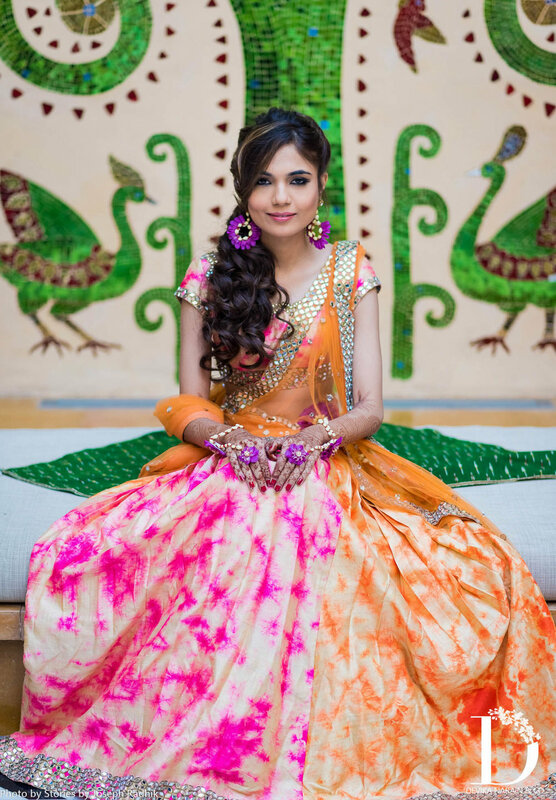 A Mehendi at their home, sangeet inspired by light at the Dusit and minimal botanical inspired wedding formed the three-day soiree at the Dusit Devrana in New Delhi. Kanika and her family wanted to retain the spirit of their family home and add colourful Punjabi details to it. A small colourful tent, bright details in the form of gota and pompoms and colourful cushions formed the background to the Mehendi and Haldi held at home. The Dusit is one of the most stunning properties in Delhi! I have always been impressed by the large waterbodies that form the centre of the hotel and wanted to create a design that incorporated them in it. Playing with light and the beautiful reflections of the structures that were cast in the still waters, we curated a design experience that was filled with drama. Floating platforms were created in the water with ceiling made of hexagonal lanterns and greens. The ballroom was transformed into a chic space matching the aesthetic of the restaurant for the sangeet and dinner. Kanika and Rakshit’s wedding was inspired by Indian Botanical prints. 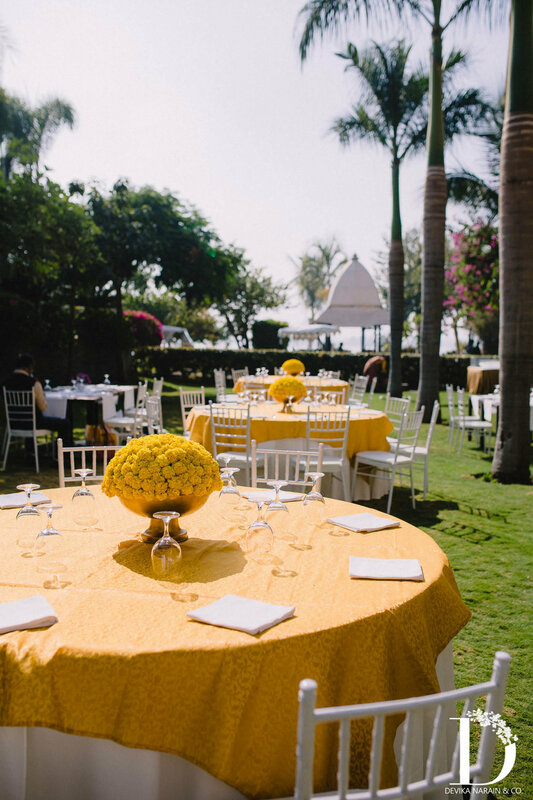 In love with the marigold,the entire setting was created around it. 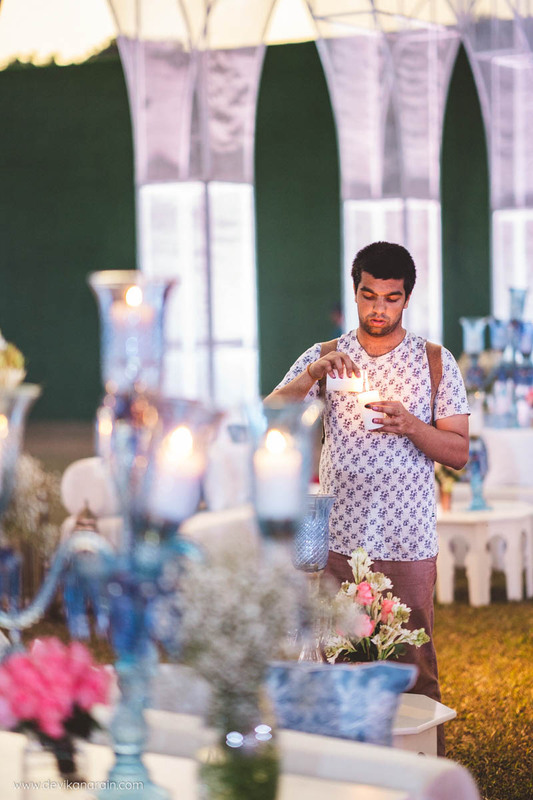 Indian details like mauli, kaliras and ghungrus were mixed with lots of candles and diyas. The reception dinner was set under a canopy of chandeliers with tall candleabras and intimate details like customised thank you notes. Aditi and I had an instant connection from the day we first spoke ( I suppose the fact that we shared our birthday had something to do with it!). A journey that began with a phone call that led to a very long drive from Ahmadabad to Baroda culminated in this beautiful wedding in Udaipur. Aditi and Shubham are childhood sweethearts(They met at a coaching institute in tenth grade) and have all the makings of a power couple- they have launched multiple businesses together, including a popular fashion retail website. Aditi had always wanted a wedding in Udaipur and Shubham decided to fulfill her dream. Their 150 guest wedding took place at The Leela Palace over two super fun days. Aditi wanted something minimal and dramatic. Inspired from the Guava gardens in The Leela Palace, we chose elements that are commonly seen in the gardens- parrots, guavas, white flowers and pomegranates. The décor and the seating was a mix of white and gold with a burst of pink! 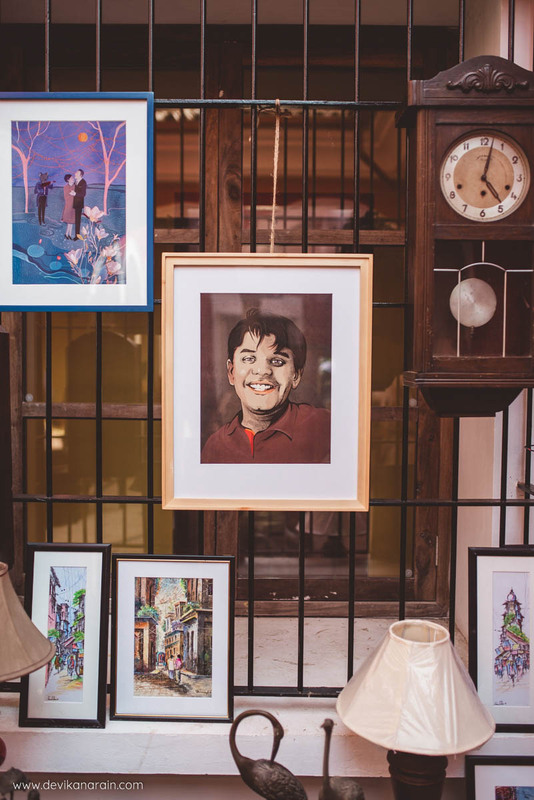 We organised lots of fun activities like kite flying, hair braiding, parrot reading, caricaturist and mehendi. White carts with white baskets displayed color blocked bangles, parandis and lehariya dupattas for the guests to pick and wear! The Sangeet happened in the Leela ballroom and terrace. The ballroom has these stunning chandelier and mirror panels – so we created something that didn’t feel too palace like yet enhanced the existing space. 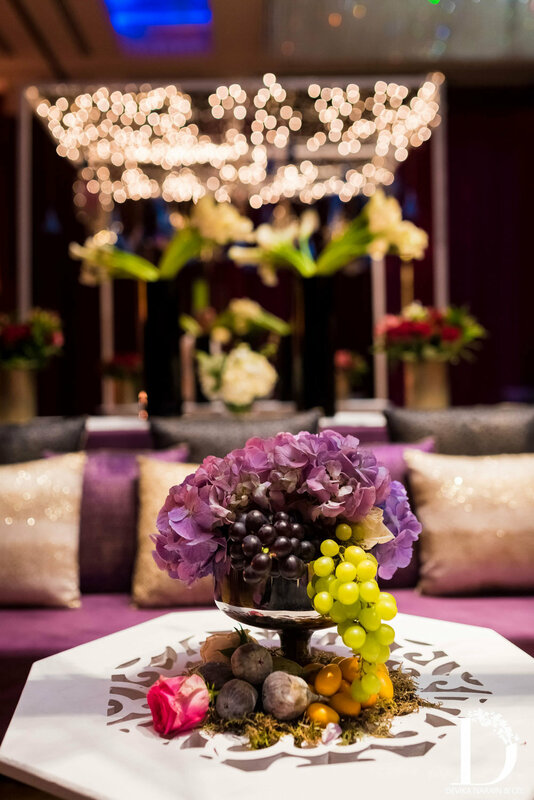 We worked with lots of gold sequins and deep tones of burgundy and purple. The décor had a print inspired from the wedding card- a raja and rani sitting on a horse. The outer courtyard or rangmanch is one of the most spectacular venues in Udaipur- it has the entire Pichola lake as a backdrop and has stellar views of the Lake Palace, City Palace and Jagmandir. This is where the wedding took place. Not wanting to create something that will take away the beauty of the space, we added splashes of marsala red into the space. The mandap was in the centre of the waterbody, draped in red and the entire ceiling was covered with rajnigandha. 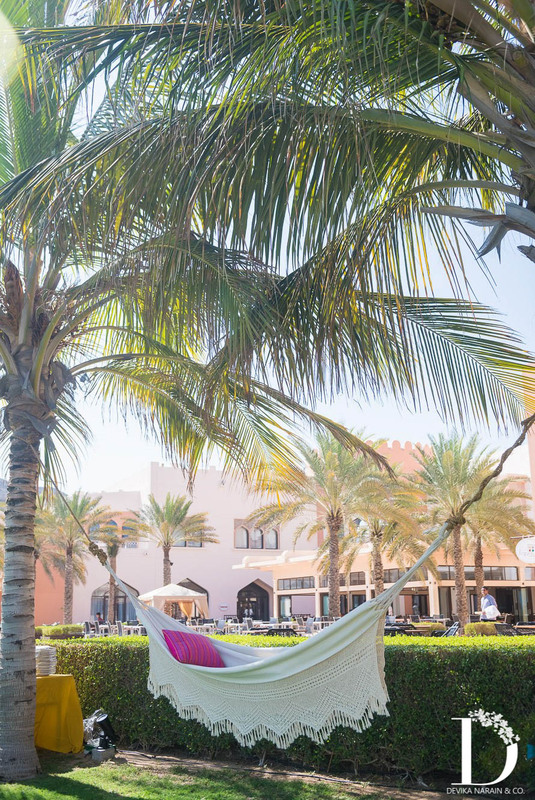 The cabanas were specially hand embroidered. Zarzodi chandowas dotted the lawns with customised coffee tables made to look like bells. 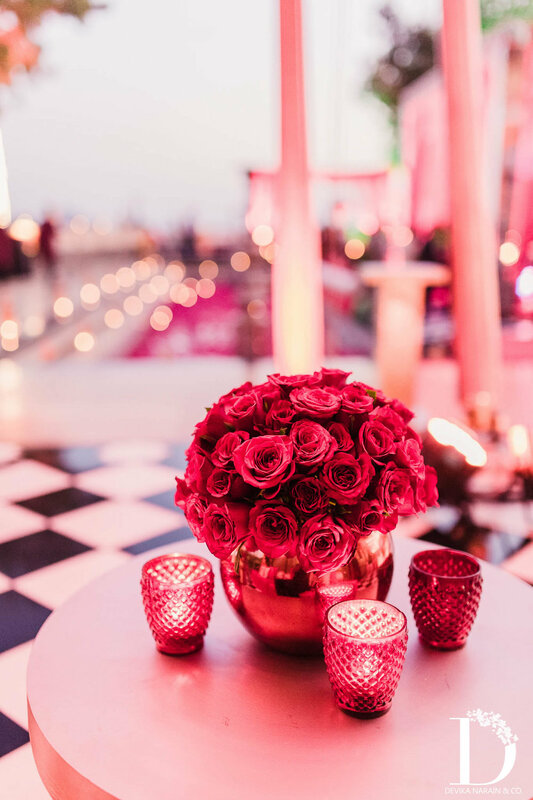 We filled the entire water body with roses and floating pattals with diyas. The décor for the Reception was classic, simple and elegant at the Guava Gardens. 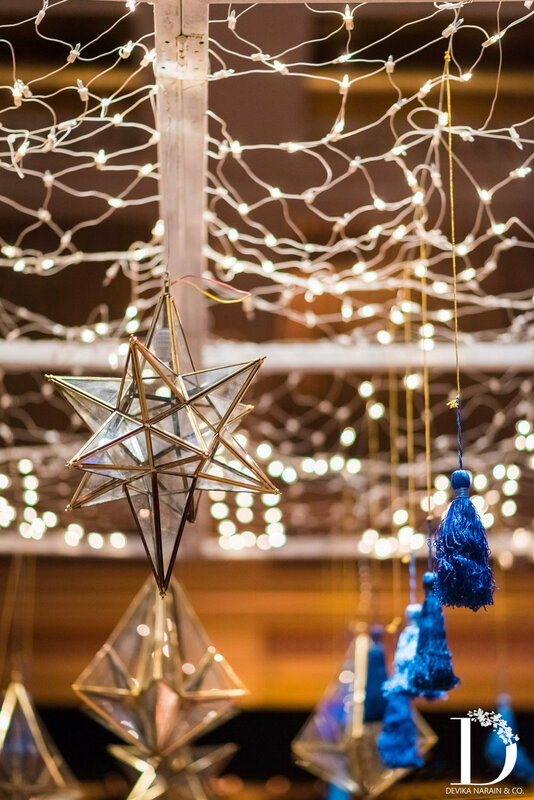 Five thousand candles were hung from the trees of the garden at varying heights. Venue: The Leela Palace, Udaipur. Sheethal Goutham and Robin Uthappa had an intimate Christian wedding in Bengaluru in the first week of March this year. Their wedding had a small guest list that included only their closest friends who stayed for a day at the Taj West End. The ceremony was simple and was followed by speeches and a Reception later in the evening. It was a one-day affair and everything had to work beautifully to fit in that day in the memory of their loved ones. Sheethal and Robin love a play of dates. His birthday is on 11.11 and her’s on 6.6, which is why they wanted to get married on 3.3 Fun, right? It all sounded simple, except that I met them exactly 30 days before the wedding. Armed with a month, I had to quickly figure out what they needed. They signed me on do everything- from clothes to invitations to decor. Robin was sure he wanted a simple church ceremony- a white wedding with all the finest things. And they wanted the wedding to be simple, elegant and classic, just like them! The first time I saw the Taj West End I fell in love with the trees. And the first time I went there, I remember how serene and beautiful the surroundings were.They have these giant trees with the most gorgeous low lying branches that hang over the lawns forming a stunning canopy of green leaves. The ceremony took place under one of these trees- in fact, the exact one that he proposed her under (if that isn’t romantic, I don’t know what is!). The ceremony area was minimal and enhanced with flowers, keeping the original beauty of the space intact. With a canvas so beautiful, it’s easier to work around creating a painting that will last a lifetime. Sheethal walked through a series of arches specially designed for her with greens, roots, white roses and blue hydrangeas. We kept the focus away from anything that looked too “made-up” and focused only on enhancing the natural beauty of the space. White orchids were intertwined with the greens to form beautiful vines. They were hung above the altar to form a natural canopy of greens and white flowers. The entire aisle was sprinkled with rose petals and lined with fresh roses (Sheethal loves roses!) for this white wedding. We added wreaths and wines of white orchids and flowy leaves to make it look like it was naturally flowering. Cascading white flowers above the altar. Just white roses and white orchids. Customized ceremony cards with their logo (a cricket bat and a tennis racket forming a heart) were placed each chair. The big tree in the centre formed a stage and we just did not want to make it too OTT so we chose to drape a beautiful sheer drape in white on it. Each chair carried a bouquet of white flowers and a wooden stand decorated with baby breaths became the altar. White flowers mixed with baby breaths, the entire wedding looked ethereal and out-of-this-world. The big kiss under the raintree where Robin proposed to Sheethal was the ultimate picture-perfect moment.